It’s not just a word for March, it’s a word for the SMU Mustangs and the Dallas-Fort Worth metropolitan area after their team exited the NCAA tournament in a manner which defies description. You know the general story: SMU, up by seven with a little over a minute left, watched UCLA’s Bryce Alford hit a three-pointer to cut its deficit to four. SMU then missed a shot, fouled, and watched UCLA move within two. The Mustangs then turned the ball over, giving UCLA a chance to win with a three. Then THIS happened, as captured by Rob Dauster of College Basketball Talk, via Student Section staffer Scott King. It’s been talked about a lot on Twitter, so let’s get right to the heart of this play. Let us briefly pause and realize that the people of Dallas-Fort Worth (and anyone else who roots for Dallas-area sports teams) have had it rough this winter, which ends in a matter of hours. First, there was the “non-catch” by Dez Bryant in the Dallas Cowboys’ NFC divisional playoff game against the Green Bay Packers, something written about at Bloguin’s NFL site, This Given Sunday. We are once again brought to a very, very simple reality after a complicated play to officiate: Rulebooks need reform. They need reform in many ways. The NFL’s rules on catches are horrible (and college football’s rules are almost as bad). Why? A play that any logical person can see as a catch (Dez Bryant didn’t really DROP that ball — he held onto it for more than a full second) was not ruled a catch, and the rules ALLOWED said play to not be ruled a catch. What we saw in the UCLA-SMU game was little different, if different at all. The shot we all saw was a shot that was extremely unlikely to go into the basket. Yet, it was nevertheless correctly ruled a goaltend, because the rulebook refers to the “possibility” of the ball going in the basket, not to the “certainty” or “extreme probability or likelihood” of the ball going in the basket. Why? The point should be obvious. As long as a shot has a one-percent chance of going in, referees are — by the letter of the rulebook — supposed to call goaltending. A shot must have no chance of going in — absolutely none — for the SMU player’s actions to be completely legal. Talking with many people after the game on Twitter, I encountered about 80 percent of respondents who said the shot had absolutely no chance of going in, and about 20 percent who felt it had a chance. Folks, that doesn’t necessarily prove anyone’s point, but the idea to underscore here is that a shot must have absolutely no chance of going in. 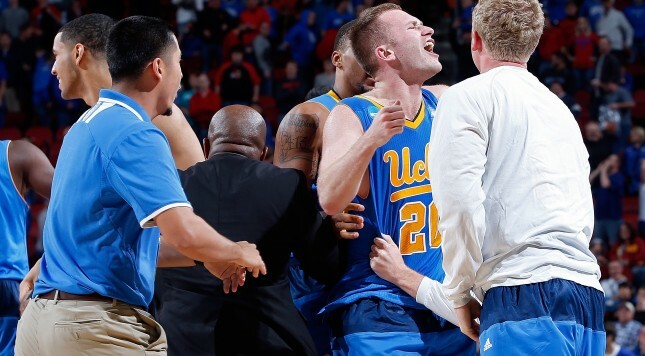 Bryce Alford’s shot was CLOSE to that threshold or standard, but it didn’t quite make it. We have seen, in decades upon decades of basketball, shots take ridiculous bounces off sides or corners of rims, leaving us speechless. If a ball has even a one-percent chance of getting on the middle of the front of the rim, some backspin can create a bounce which keeps the ball in the cylinder and gives it a small chance to drop in the basket. You can doubt that Alford’s shot would have gone in, like the rest of us. Saying that the shot had zero-percent chance to go in is a contention which is “possibly true,” but the standard we’re shooting for here (pun not intended) is absolutely true. If 20 out of 100 people in the room think a shot had a chance, we’re really not in the realm of absolute certainty. This has to be a play in which 100 out of 100 people in a room, with zero doubt, can say, “that shot had no chance to go in.” Then, by the letter of current college basketball rules, goaltending would not apply to a shot. It’s terrible for the people of Dallas, but it’s true: A horrible rule was correctly applied. Again. DON’T blame SMU’s Yanick Moreira, who saw that the shot was off target and wanted to sweep the ball out of the area of the basket like a hockey goalie does with a puck near the goal mouth. Blame the rulebook… as was the case in the Dez Bryant situation. For SMU and the sake of other basketball teams that have ever lost on a hard-to-take goaltending call, the solution moving forward is simple: We need FIBA rules for both goaltending and basket interference, supplemented by a change of wording from “possibility of entering the basket” to “likelihood of entering the basket.” Such reforms would allow for a lot more athletic activity near the rim, allowing players to play in accordance with their natural instincts and not having to worry about one- or two-inch differences relative to the cylinder. This makes complete sense in creating more freedom of movement for players and removing complicated decisions from the hands of officials. In other words, college basketball’s probably not going to do it… much as Bryce Alford’s shot probably wasn’t going to go in. Prove us wrong, college basketball: Reform goaltending and basket-interference rules. If you do so, this outcome will not have been in vain for devastated Dallas-area sports fans.